The find handles or DLLs tool enables you to search for specific handles, DLLs and mapped files of the currently running processes by entering their names. 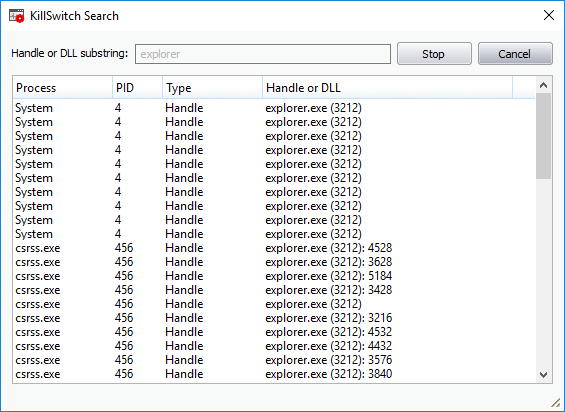 Alternatively, click the Find Handles or DLLs icon from Tool bar. 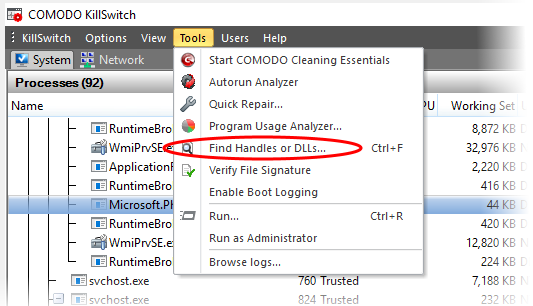 The 'Find Handles or DLLs' dialog will open. Enter the name of the object you wish to search, in the Filter text box. The entered string can be a sub-string of the object name. The search key is not case-sensitive. The results window will contain the process(es) associated with the object, the type of the object and its handle as a table. The title of the activity triggered by the handle or the DLL. Clicking the column header sorts the entries in alphabetical order of the process names. Process Identification number of the activity. Clicking the column header sorts the entries in numerical order of the PIDs. Whether the process is triggered by Handle or DLL. The executable file that has triggered the process along with its storage location.